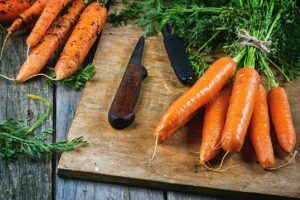 You can buy carrots in the shops almost any time, but nothing beats your own early carrots for flavour and juicy crunchiness, harvested just before eating in spring. Carrots sown in a tunnel or glasshouse in February are ready to eat about late May, well before any crop sown outdoors would be ready. In milder areas, seed can be sown in January for even earlier crops. The traditional varieties such as ‘Amsterdam Forcing’ or ‘Early Nantes’ are as good as any for early sowing. Border soil for sowing carrots should be light, stone-free, without recently added manure or compost and above 5°C. Sow the seed thinly in drills about a centimetre deep and 20 cm apart. If the soil is very poor you could sow them in large pots of prepared compost or compost/soil mixture. Cover the drills or pots with fleece on cold nights to keep the soil as warm as possible: the warmer the soil the faster they germinate and grow. Protect the emerging seedlings from slugs, and as soon as they are big enough to handle thin them out to about five centimetres apart. Do not let the soil dry out, as it stalls growth and the carrots can split when watered again. If not eating harvested carrots right away, cut off the leaves to prevent them drying out and shrivelling the roots.